QTIP: Will Gmail fetch your old mail? After years of knowing you should do it, you finally switched to Gmail. Hurray! and farewell to your tortured codependency with Optimum Online, AOL, Yahoo, Comcast or other legacy email providers. We’ll refer to the above mentioned legacy email providers as @OptAOLhooCast. In almost no time after setup your new Gmail account begins to fetch your @OptAOLhooCast messages and they magically appear in your new Inbox. Your world becomes serene. Bliss and soft light surround you. But, before long whiffs of doubt creep back in. You begin to wonder if you’re missing any, even one, @OptAOLhooCast message. A kind of buyer's remorse darkens your mood. "What ifs" swirl in your mind. "What if an email I expect to be sent from a neighbor to my @OptAOLhooCast address isn't fetched into my new Gmail Inbox? What if a message from one of the kids, a long-lost pal, or even spam is lost?" Breeathe. You’re probably experiencing FOMO, a recently defined syndrome of this digital age. "What is FOMO?," you ask. Fear Of Missing Out. Yup, it’s a thing. Make sure that your computer or mobile device is connected to the internet. Yes, really. If Gmail fetches any messages sent to your @OptAOLhooCast address, then Gmail’s (webmail) Check mail from other accounts settings are correct. Explore Gmail’s new webmail interface and settings for Configuring Inbox messages under Primary, Social, Promotions and other tabs that learn which incoming messages should go where and tidy-up your Gmail webmail Inbox. If an expected message is nowhere to be found, confirm that the sender of missing messages is not herself blocked from sending email from her computer or mobile device. Check underneath Gmail’s webmail Inbox among labels (a.k.a. folders) for a mailbox with your @OptAOLhooCast address. It will list just your fetched messages unmixed with others. Check for messages under the webmail All Other Mail label. Check Spam and Junk mail folders. 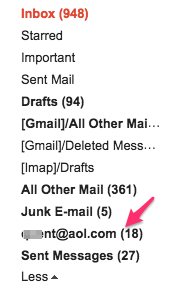 Gmail may filter as Junk some @OptAOLhooCast messages that were previously not filtered out by your old mail provider. Review your Gmail Inbox for messages from Google Security informing you of messages that have been blocked because infected content was detected in them. No need to thank Google. It’s what they do. If you use an email reader app (Outlook for Windows or Mac, Mac Mail, iOS Mail, Gmail app for iOS or Android, et al.) log onto your @OptAOLhooCast account via webmail and search for truant messages. Be careful to avoid downloading infected messages that may still lurk in your old email account. Send a new test message from your Gmail account to your @OptAOLhooCast email address, then check your Gmail Inbox and Sent mailboxes. Ask a friend to send a test message to your @OptAOLhooCast email address. Ask senders of missing @OptAOLhooCast messages to send you messages only to your new Gmail address. Search your Gmail for missing messages from specific senders, with specific Subject lines, words and/or phrases. You may be surprised at what has come in already. Let us know if these tips are helpful.